Last Wednesday we had another great Cooking for a Cause event. 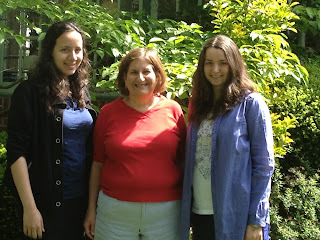 Special thanks to Carol Chera and Michelle Levy, mother of Joseph Levy, for helping out. 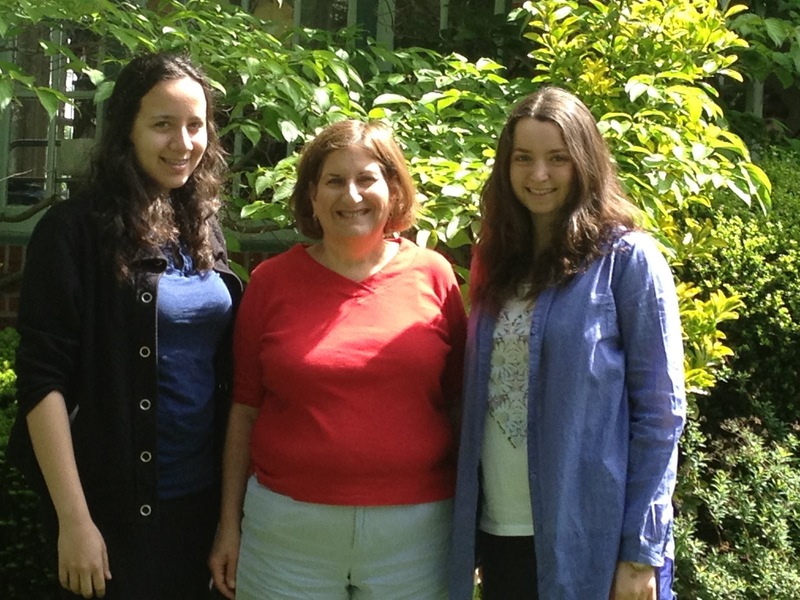 Over the past few months Yeshivah of Flatbush students, Jamie Baum and Jeanette Eliezer, interned with the Sephardic Heritage Project doing genealogy research. This was part of our Pathfinders Program. What Does Yerushalayim Mean To You? Join us this Sunday and celebrate Yom Yerushalayim 5772! On Tuesday May 15, some of our students attended the Sephardic American Jewry Communities and Contributions panel and exposition, facilitated and presented by the Jewish Studies Center at Baruch College Performing Arts Center. Our forty attendees enjoyed a panel of impressive speakers, among them Rabbi Marc Angel, Rabbi Emeritus of Congregation Shearith Israel and author and editor of over 30 books, Dr. Jane Gerber, professor of Jewish History, noted author and director of the Institute for Sephardic Studies at the Graduate Center of CUNY and keynote speaker, Lucette Lagnado, award winning writer and reporter for the Wall Street Journal and author of The Man in the White Sharkskin Suit and The Arrogant Years. Jeffrey Peck, Dean of Baruch’s Weissman School of Arts and Sciences spoke of his commitment to establishing a Sephardic Studies department. The program offered a tremendous insight into the Sephardic past and an opportunity to see our ancestors through a critical lens and an academic view. Four teams of students representing Yeshivah of Flatbush recently won highest honors in the year end standing of this year's WordMasters challenge, a national competition for high school students requiring close reading and analysis of many different kinds of prose and poetry. Participating with 548 high school teams from all across the country, the school's ninth graders placed first in the nation, in the cumulative standing and the end of the four meets held this year. At the same time, our tenth graders placed second in the nation, eleventh graders tied for sixth in the nation, and the twelfth graders placed first in the nation. The teams were supervised by Mrs. Shifra Hanon. In addition, we are proud to congratulate our students who have won highest honors for year long individual achievement. Freshmen Sarah Levy and Rebecca Zami, Sophomores Bob Husni and Andrew Hersh all placed among the 22 highest-ranked students at their respective grade levels. Andrew Hersh was one of the two highest rated tenth graders rated nationwide. Several students earned outstanding results in the year's final meet, held in April: Freshmen Abie Tawil and Victor Zeitoune and Seniors Raquel Lifschutz and Rachel Weintraub all earned perfect scores in this meet, while in the entire country only seven ninth graders and only 19 twelfth graders did so. A special congratulations to all of our honored students! 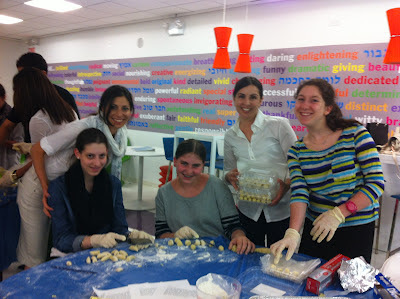 Cooking for a Cause: Pasta Week! This past week was pasta week with the wonderful volunteers at Cooking for a Cause. This week's event was generously sponsored by Mrs. Micky Horovitz, mother of student Elliot Chalme. We made delicious penne vodka, macaroni and cheese, and crazy ziti. Special thanks to our chefs, Mrs. Micky Horovitz and Mrs. Lesly Chera (mother of student Esther Chera). 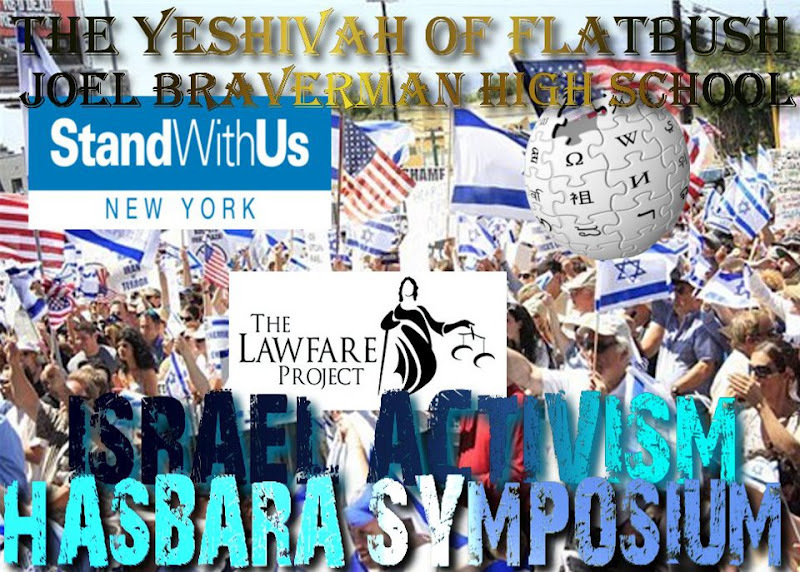 An Israel Activism Hasbara Symposium was held at Yeshivah of Flatbush on on May 3, 2012. Speakers included Joey Cohen-Saban (HS '11), representing the campaign to elect Assemblyman Hakeem Jeffries to Congress; Avi Posnick, the regional director of StandWithUs; Benjamin Ryberg, the director of research at the Lawfare Project; Ari Lieberman, an expert on racism and bias on the Internet and Wikipedia; and Michael Ross, a man who fell in love with Israel, converted to Judaism, joined the IDF, and was recruited into the Mossad for 13 years. It was a huge success. Thank you to the Israel Awareness Commission for putting this all together. Listen here to Akiva Abramowitz on JM in the AM this morning with Nachum Segal and Meir Weingarten, where he spoke about his Chidon HaTanach experience in Israel. 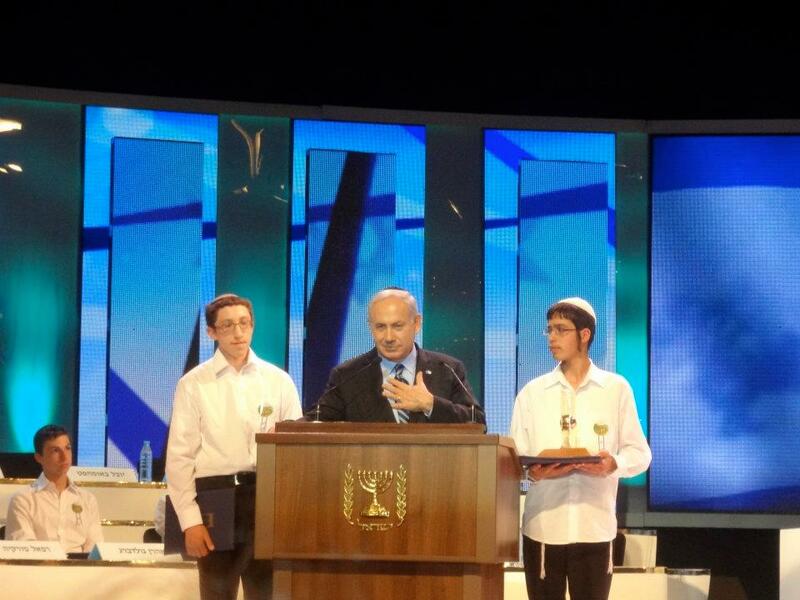 Akiva won first place in the Diaspora contest and second place in the international contest. Skip to 1:34:35 below or click link: here. 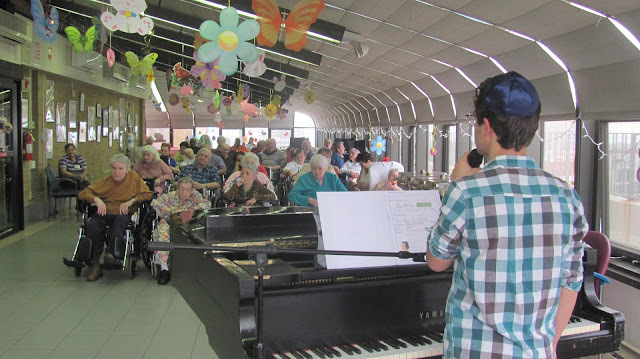 Michael Zalta, freshman, used his musical and vocal talents to entertain the residents of Shore View Nursing Home. This was part of our Pathfinders Program, where he pursues his interests in music. Our students had a unique opportunity to participate in a Jewish Day School Poettry Slam Competition last week. Jonathan Zehavi, Yaron Baazov, Bonnie Azoulay, Tamar Grazi, Jacob Tessone and Miriam Wade all performed beautifully. Jacob Tessone made it to the finals and Miriam Wade won an award for best performance. The theme of the slam was redemption being that it took place right after passover and before Shavuot. Congratulations to all of our Poets and a big thank you to Ms. Robinson, the faculty advisor for the Poetry Slam. 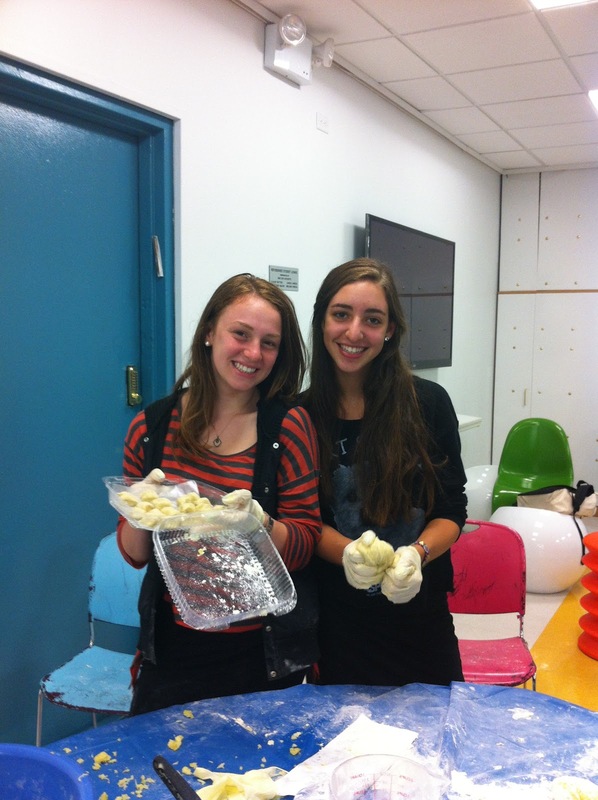 Yom Ha'atzmaut was celebrated in multiple ways this year at the Yeshivah of Flatbush! 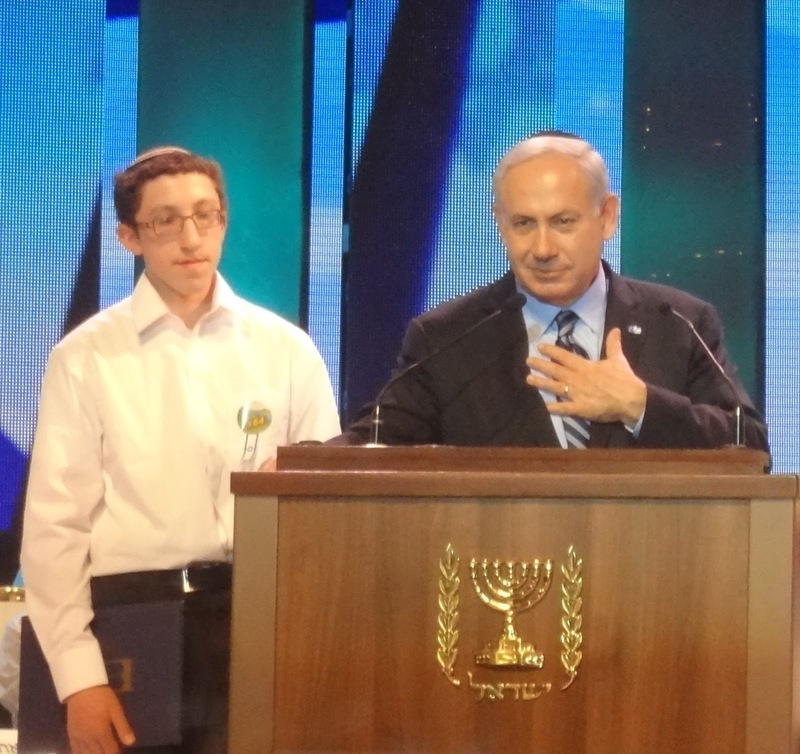 Our Yom Ha’atzmaut celebrations were enhanced by the announcement that Akiva Abramowitz, a senior in our High School, placed second in the world in the 49th International Bible Contest for Jewish Youth (Hidon HaTanach Ha-Olami) held in Jerusalem. He was first among Diaspora students. Akiva’s hard work, commitment to learning Torah, and natural abilities enabled him to achieve this unique distinction. We congratulate him and Rabbi Taler, who served as his advisor. The day before Israeli Independence day, our school commemorated the memories of those soldiers who lost their lives fighting for the state of Israel. Special Thanks to Dr. Lea Gerber for coordinating this very moving program.